What Next with Critical Voter? Home » Blog » What Next with Critical Voter? I hope this week’s postings gave you a small taste of what can be gained from turning the upcoming election into an opportunity to become critical thinkers. For you political junkies eager to figure out the status of the candidates, that visit I described to various campaign headquarters demonstrated how some inductive logic fueled by the right background knowledge can turn even small amounts of new data (like observations at various campaign headquarters) into insights regarding who is up and who is down in the race. Such insights need to be tempered by intellectual humility, a phrase I learned from the Critical Thinking Foundation (a California-based educational non-profit) which asks us to be ready to accept the fact that we might be wrong (without letting that acceptance make us fearful of trying to get things right). But given how many filters, such as the media and the campaigns, try to distort our observations and pre-determine our conclusions, a sound mix of observation, knowledge and logic can get you pretty far when it comes to making up your own mind. Now presidential elections only come around once every four years. But critical thinking skills can be put to use every day at home, at school, at work, in fact anywhere that you need to reason, understand and persuade. Speaking of persuasion, while I don’t expect many of us will be appearing before a presidential Town Hall campaign event in New Hampshire, all of us will find ourselves trying to convince an audience of something today or in the very near future. In which case, looking at how John Kasich tailored his message to fit his audience is not just a lesson in politics. It also teaches us the centrality of knowing who you are trying to convince, especially in situations where the real audience might not be obvious (or even present) when you make a persuasive argument. All this and more is covered in Critical Voter, out on Monday (just in time for the Iowa Caucuses). Speaking of which, next week this site will be kicking into higher gear with the book’s official release announcement followed by some thoughts about what we can make of the results of Iowa from a critical-thinking perspective. 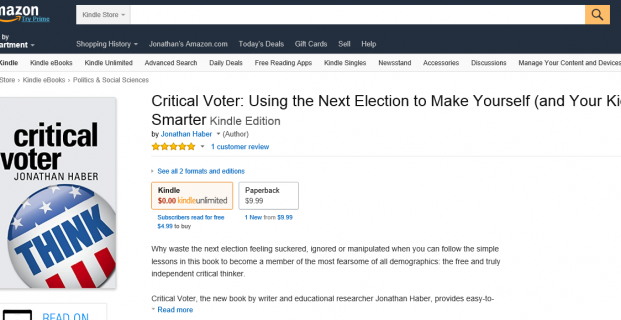 I’ll also be starting some semi-regular features here on the blog to accompany critical thinking lessons drawn from the campaign, including reviews of books mentioned in Critical Voter and some reflections on lessons learned from going down the self-publishing route. And stay tuned for the critical thinking curriculum tied to the book which will be released on March 1 (Super Tuesday). That’s it (for now), and I’m looking forward to hearing from readers once Critical Voter hits the electronic shelves after the weekend.